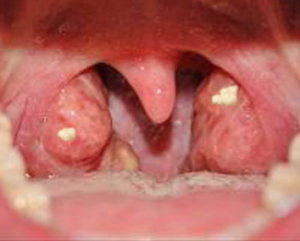 Tonsil holes can be the perfect breeding ground for bacterial or viral infections. This can lead to more serious medical infections like tonsil stones. Some people develop small pockets in the tonsils, and these can trap debris within them. This article will help you to cure and clean tonsil holes after a sore throat or strep throat. Tonsils are an important part of your lymphatic system. Troublesome tonsils in the past were routinely removed. However, medical studies show that your body needs your tonsils to keep viruses at bay. So more often today, tonsils are not removed unless they are severely infected or other medical issues are in play. Tonsils protect you from some types of infection and disease. The only time they should be removed is when they are so large that they cause you difficulty in eating, swallowing and even breathing. What do holes in tonsils mean? If you have tonsil crypts or holes, it means that some food you eat will get stuck in those holes. As time passes, there is a significant amount of debris in the holes, including food, dead cells and mucus. This debris in the tonsil holes causes problems for your mouth and oral cavity. You may be more predisposed to bacterial and viral infections. This is caused by warm moisture in your mouth combining with the decomposing debris. It will also cause you to experience bad breath. Sometimes, debris in tonsil holes may become hard, causing tonsillar stones. These are believed to be genetic. Children may get tonsil holes from bacteria invasion or infection. Strep throat is one of the causes of tonsil holes. It is caused by a bacterial strep infection. This bacteria inflames your tonsils and throat. You may also experience a sore throat. Some people even develop white pockets on their tonsils after a mild sore throat. Does smoking cause tonsil holes? Smoking cigars and cigarettes is a hazard to your health, particularly if you have infected tonsils. The holes themselves are not affected by your smoking. However, cigarette smoke contains many chemicals that irritate the tissue in your tonsils and throat. Due to this issue, smoking with tonsillitis makes that condition worse. The chemicals in tobacco will be caught in the tonsil holes, making them even more likely to become infected. There isn’t much information that links tonsil holes to cancer. However, if you have throat and tonsil cancer, you still may develop tonsil holes. Tonsil cancer generally starts in the mouth lining, and this includes the tonsil area. Alcohol consumption and smoking are risk factors for the tonsils, according to healthgrades.com. You may develop holes where dead cells combine with the other particles in the holes. Mononucleosis is an infection (viral) that can affect your tonsils. If you have it more than once in your tonsils, you may develop more pockets, which means more white blood cells are needed to fight the infection. Gargling the tonsils and throat with salt water can help to resolve this issue. If you’ve had a tonsil infection, you may have noticed white pus in the tonsil holes. They become filled with food particles, bacteria, calcium deposits and mucus. If your tonsils are infected, they may appear white or yellow, and you may experience bad breath. If you note unusual or troubling holes on your tonsils’ surface, consult your physician and have them examined. Treatment may include antibiotics or surgical removal of the tonsils. If your tonsils are infected, they may develop holes. You have likely seen white or yellowish white substances with irregular shapes. The lining of your tonsils is sensitive, and this is probably the reason why people with tonsil infections feel irritation in their throats. Oral mucosa sheds periodically, just as the skin does on the outside of your body. This means that there are dead cells combining with the mucus and saliva, and you’re swallowing this mixture. The surface of tonsils is usually pit-marked. They may become huge and deep enough so that they more closely resemble holes. If you develop tonsillitis, you may be able to see whitish colored chunks on your tonsils in the back of the throat and on the tonsil surface. Tonsil stones may appear as pockets that can fill with bacteria and debris forming in the crypts of the tonsils. It may cause pain if the tonsils are infected all the time. People with chronic tonsil inflammation or recurring tonsillitis cases are more likely to develop the pockets behind the tonsils. At times, these pockets may be swollen and painful. The tonsils themselves may bleed and hurt, due to irritation caused by the infection of the tonsils. Can holes in the tonsils cause swelling or pain? Your tonsils, sitting as they do in the back area of your throat, help to protect you from disease. They fight against bacteria and infection. This means, simply, that if your tonsils are intact, you will not be as likely to suffer viral or bacterial infection. The crypts of pits in your tonsils collect debris from the lining of your tonsils and the mouth and throat. In many cases, the pits end up in a solid form, making a hard surface in the tonsils. This is not painful. Unless your tonsils become irritated from things like cigarette smoke or spicy foods, you may not feel any pain. If you have deep, severe and infected tonsil holes, you may experience pain from salty and acidic foods. Can you heal the holes in your tonsils? You should understand that tonsil holes are normal. They offer a space where your white blood cells can effectively fight bacteria that enters your body through your mouth. However, tonsil holes that cause pain and bleeding need to be treated. Exercising good hygiene like brushing your teeth, along with the tongue surface, on a regular basis will reduce your risk of infection from bacteria. It also removes foods that could otherwise stick on your tongue and then your tonsils. In most mild cases, tonsil holes do heal by themselves, without intervention. You can seek additional information from your physician if you’re not sure whether your tonsil holes need some type of treatment, or not. Add one tablespoon of sea salt to one cup of water. Gargle in your throat and tonsils with this salt water to disinfect your mouth. This can be done several times a day, to keep your mouth fully clean. This helps in removing the bacteria that might otherwise be harbored in tonsil holes.